Datrium splits speed on servers from durable data on the network. So it’s Open to run with any server — including blades — and provides Convergence of I/O processing on the server. VM and IO processing on Compute Nodes is split from durable data on Data Nodes. The split architecture eliminates east-west traffic between Compute Nodes so there is never neighbor noise or network overhead, so the system can mix and scale workloads massively. Compute Nodes maintain all VM data in local flash for ultra-low latency performance, and are stateless so maintenance is simple and data availability assured. Data Nodes maintain all persistent copies of data, which is always compressed, globally deduped, and erasure coded with double fault-tolerance. Leverages surplus host CPU for all data services, including erasure coding, data reduction, encryption, data mgmt. Maintains all VM data in local flash for ultra-low latency performance, outperforming all flash arrays by up to 4X with flash or NVMe at a fraction of the cost. All Compute Nodes are stateless so maintenance is simple and data availability assured. Pre-configured with fully redundant, hot swappable components. Includes mirrored NVRAM for fast writes, and quad 10GbE or dual 25GbE network ports with load balancing and path failover. Capacity optimized with always-on global dedupe, compression and erasure coding for either disk-based (lowest cost) or flash-based (highest performance) data nodes. Any server-type is supported, including blades and quad-socket servers. Combine any vendor, any generation server, and any configuration within a single DVX. For the first time, a server powered converged infrastructure system can provide fully independent scaling of host storage speed and persistent capacity to simply and incrementally match resources to evolving tenant requirements. Add only the resources you need, when you need it. Scale up to 128 compute nodes, 250 GB/s and 18M IOPS, and up to a petabyte of capacity across up to 10 data nodes. IO processing leverages up to 20% of surplus local CPU. Where additional CPU is available, Insane Mode can double per-host performance in-place and on-demand by reserving up to 40% of processing resources. Always-on declustered erasure coding protects cold as well as hot data with only 25% overhead. All data is deduplicated and compressed before being written to compute node flash, then globally deduplicated across all compute nodes once written to data nodes. 100% software-based, combining always-on, efficient data reduction technology with high-speed encryption end-to-end, protecting data in-use at the host, in-flight across the network and at-rest on persistent storage. Start with a massively scalable VM backup catalog called ‘Snapstore’. Snap and instantly recover not only VMs, but vDisks as well, important if you want to recover data without taking powering off your VM or reconfiguring a new one. Logical groupings of VMs or Containers are called protection groups. For each protection group, set snapshot backup schedules, replication targets, etc. Finally, Dynamic Policy Binding auto-includes new VMs into a protection group based on naming convention. A flexible, server powered replication technology where snapshots are replicated host to host, flash to flash. The more hosts involved, the faster replication happens. A variety of topologies are supported – many to 1, 1 to many, bidirectional, etc. Replication is encrypted end to end and fully WAN-optimized with only deduped, changed data sent over the wire. Cloud DVX is a cloud-native instance of Datrium DVX that provides backup and recovery as-a-service to public cloud, and includes global cloud deduplication so end-customers can simply consume the cloud capacity at the lowest cost of ownership. 5X lower latency than all-flash. High performance density–up to 100 effective TBs of server flash–means all read I/O stays local, eliminating SAN latency. Adding servers adds speed. 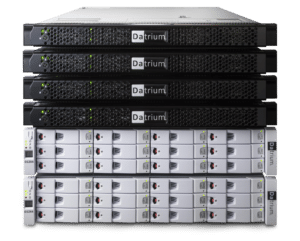 With server-based I/O resources, your Datrium DVX gets faster as you add more servers, up to 32 per DVX. More speed at your fingertips. Use Insane Mode to accelerate your VM with a button click or use vMotion to move your VM to an under-utilized server. BYO Server and Flash. Use any mainstream server, including blades and “brownfield.” And server-flash is about 1/8th array-flash cost. 2-to-6X Data Reduction. Dedupe and compression are in-line always-on. And global deduplication keeps capacity low across all servers. Scale I/O Speed and Capacity Independently. You can add flash without adding hosts and additional software licenses. You already know how to use it. Datrium is VM-centric, so there are no LUNs or disks to manage, and you can provision new VMs up to 4X faster. Take the guess work out of DEV/OPS. Real-time VM analytics provides per-VM statistics for powerful monitoring and simplified troubleshooting. Mix Workloads and Scale Massively. Host isolation eliminates neighbor noise so consolidating and scaling diverse workloads are predictable. Server Failure Tolerance. Take servers down without lengthy data rebuilds and your data remains available even if multiple hosts fail. Blanket Encryption. End-to-end encryption with data reduction to secure your data in-use, in-flight and at-rest. The challenges you face at your place of business demand fully-functional, targeted solutions. If you have a need or particular pain point – be it a desire to address primary storage, backup, disaster recovery, or an archive project – we can help.